I think I’m going to call 3M ScotchBlue right now and suggest this as their new jingle. Kind of catchy isn’t it?! Check out my project tutorial on revamping an old cabinet door below. Go ahead, grab your paint and brushes — and don’t forget a roll of ScotchBlue painter’s tape! Clean the doors! If you have a cabinet that has finished it’s first life as a kitchen cabinet, and has so much grease on it that you could grease a pig…well, you need to clean it off. I experimented with several different techniques (GooGone, Dawn Detergent, Shakelee DeGreaser Spray, and Ammonia), but the one that worked best was inexpensive ammonia mixed with hot water. Wipe off the door thoroughly with a damp baby wipe. Let the putty dry for about 10 minutes. Sand the panel until it is smooth. Wipe off the cabinet door again. Be sure to get all the sawdust off. Spray your cabinet door with spray primer. One coat should be enough to cover the door. It helps to elevate the cabinet with a block or two underneath so it doesn’t stick to your drop cloth. Mask off the middle of your door with newspaper and ScotchBlue Painter’s Tape. Press the edges down firmly by running a finger along the edge. (If your cabinet door is very textured, you can seal the edges by brushing matte medium where the tape meets the door. Remove the mask, now ooo and aaaa over that clean edge! Give the paint about an hour to cure before the next step. 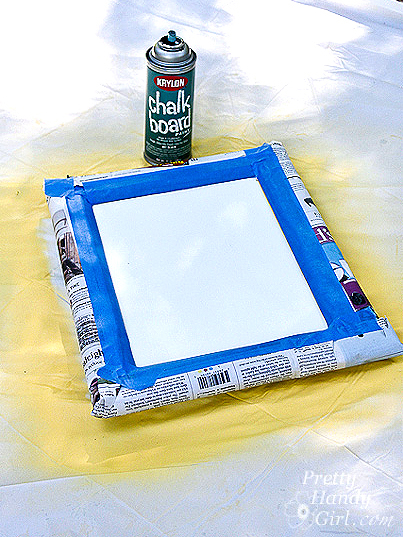 Spray the inside panel with 2-3 even coats of the chalkboard paint. Let it dry throughly before you remove the tape and newspaper mask. …or if you are a perfectionist (like me), you will want to cover the woodgrain on the frame with scrapbook paper. 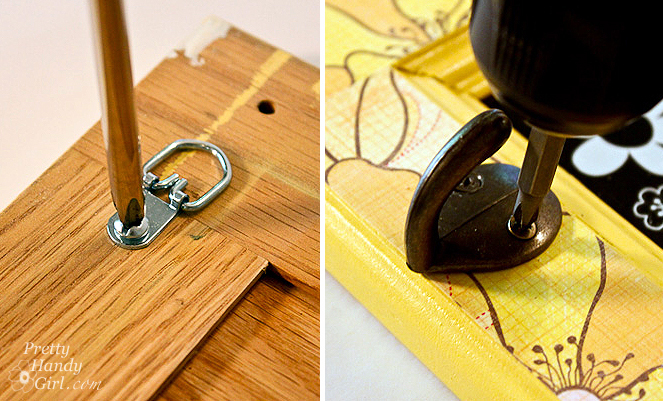 Simply measure your border and cut scrapbook sheets to that width. It is okay if your sheets aren’t long enough to fit on one length, you can tile them. 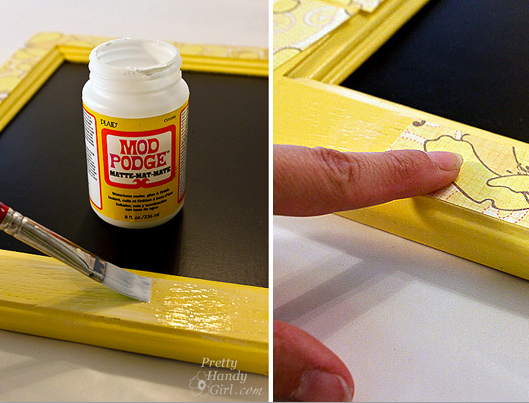 Brush one layer of mod podge onto the frame then lay the scrapbook paper on top of the mod podge. Press out all the air bubbles. Let the mod podge/paper dry for a few minutes. Then brush 1-2 coats of the mod podge on top of the scrapbook paper borders to seal the paper. 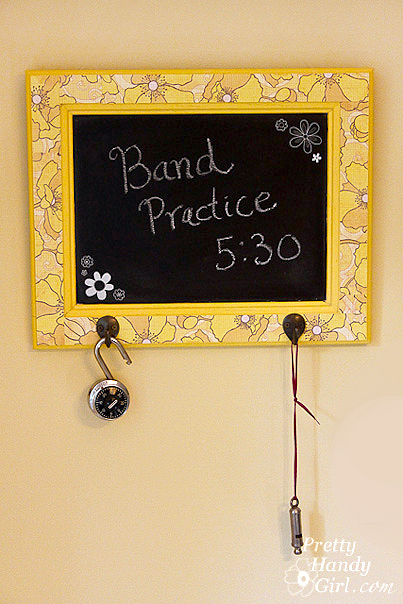 To make your chalkboard frame more functional, add 2 D-rings on either side of the back for hanging purposes. Then add some garment hooks to the front. Don’t forget to season your chalkboard. (I prefer Old Bay seasoning…just kidding! I always wanted to say that.) 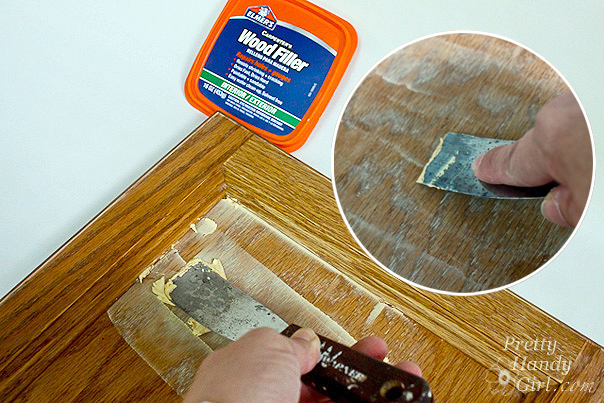 Rub a piece of chalk on its side all over the surface and then wipe it off with a dry rag. And that concludes the tutorial. Don’t you think the results are sweet! Especially because it is made from something that would have otherwise been discarded. 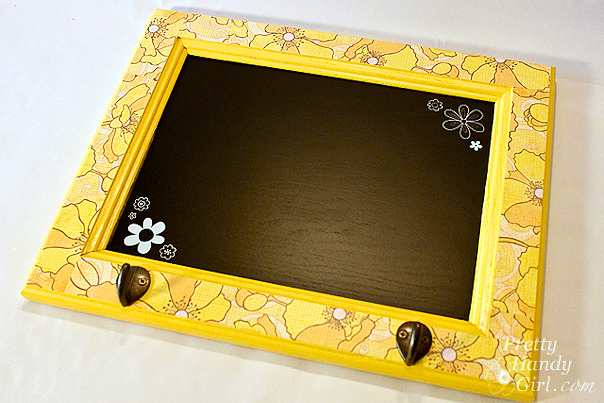 I envision a wall with several of these chalkboard frames lined up, one per family member. That way a message can be written to each person. I guess I better get busy and make 3 more. I love how the hooks add additional storage! Be sure to use two picture hangers (one for each D-ring hook.) If you have good eyesight you might have noticed my fishing line that is hanging the cabinet above. This was for photography purposes only. Unless you want your frame to rip the drywall and land on the floor the first time your child wants to hang something heavy on the hooks, do as I say, not as I do. Awww, isn’t she just a perfect little slice of sunshine on a blank wall? She makes me happy. You made it through another one of my insanely long tutorials! Congrats! Disclaimer: I was one of the bloggers chosen to host a ScotchBlue Painting Party. I was not paid or compensated for this post. I was sent a few rolls of ScotchBlue painter’s tape, but I honestly can’t remember if it was 2 or 3 or 5 because they promptly got added to the collection of ScotchBlue tapes I already own. Love the cabinet revamp! So glad we got to do this party together–your blog is always so inspiring! Yikes! I actually have all the products needed to do this very project (except for the special super-duper Scotch Blue Tape with Edge Lock), but I would really like to do something with a mid-Century record cabinet I inherited from a sweet neighbor. I don’t Tweet, but I did Like Scotch on FB and posted the giveaway on my own FB page. Thanks for the great project and giving us a chance to play along. Michelle, LOL! No I was never a teacher, but thanks for the compliment. Haven’t tried the blue tape yet. Thanks for the offer though. Love your idea…my mind is spinning now at bedtime so excited about doing something like this…thanks for an awesome idea! It is so adorable, sunny and so useful!. Well, I just took down blue painters tape, and would use more Scotch blue for my next painting project: the dining room. I lov to paint, and just paint and repaint at will.